Buying a second home can be a frightening thought. After all, shouldering two mortgages is certainly enough to make your head spin. In fact, we don’t recommend it for everyone. Or even most people for that matter. However, taking on two mortgages can be a great option for those who are looking for a vacation home or rental property. 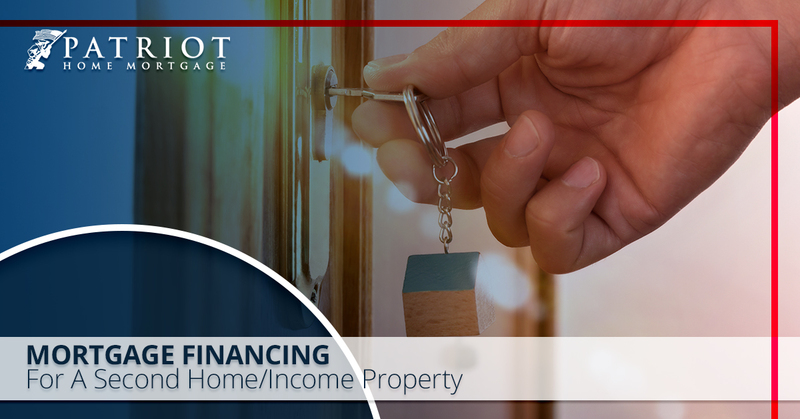 Patriot Home Mortgage is a broker who can help you find mortgage financing for your second home or income property. In this article, we’ll discuss some of the things to consider when seeking to purchase a second home or income property. Surprisingly, there are differences between the two when it comes to purchasing a second home for yourself or using it as a rental property. There are also differences when it comes to first and second mortgages. While you may be able to get away with 3 to 5 percent down with a first mortgage, you are going to need at least 10 percent for a second mortgage. In most cases, lenders are going to want to see 20 to 25 percent for you to qualify for a loan. The federal government doesn’t provide any help for those buying a secondary residence or income property. This means you won’t be able to use an FHA or VA loan to help alleviate the burden of a down payment either. However, if you have a sufficient amount of equity in your first mortgage, you could take out a home equity loan to get the funds you need for a down payment on your second mortgage. Around 20 percent of those who buy second homes tap into their first mortgage for the funds. Qualifying for a loan for a second or investment property can prove difficult if you have a current mortgage loan. Lenders are going to take this into account as part of your debt. What is a Second Home and What is an Investment Property? A second home would be more akin to a vacation home. You’re buying it for the purpose of living in it on a semi-regular basis. For example, if you bought a home near the beach or up in the mountains to spend time in during certain seasons. Or perhaps your job allows you to work remotely and you want to buy homes in two different states to make the most of different types of weather. To qualify as a second home, the property must be a sufficient distance away from your primary dwelling. Lenders will only consider a property a second home if it is at least 50 miles away from your primary residence. An investment property is one in which you don’t plan to live primarily. They are bought for the purpose of receiving income. So why does it matter that we make a distinction between the two? The biggest reason to make a distinction between rental properties and a second or vacation home is the interest rate. Lenders usually charge home buyers higher interest rates when they are borrowing mortgage money for an investment property. While this may seem strange at first, there’s a reason: If buyers aren’t using a home as their primary residence, lenders believe they will more easily abandon their payments for a house that’s not their primary home if they suffer financial hardship. Given the same exact same property, down payment, and cost of the home, there could be as much as a 0.7 percent difference in the interest rate over a 30-year fixed-rate loan between investment properties and second homes. It can be enticing to try and cheat the system by saying you are going to use your investment property as a second home to get a lower interest rate. However, being caught for mortgage fraud can lead to hefty fines. Lenders have been doing this for a long time and have been trained to spot fraud from a mile away. As a final aside, there is something very important to consider: owning a second home costs a lot more than just having two mortgages. Affording a home is not the same as being approved for mortgage financing. When approving your loan, lenders do not consider your maintenance costs, utilities, furnishings, and repairs. House upkeep does not come cheap, even if you take very good care of it. They also don’t think about the costs having tenants can occur in rental properties. You may have tenants who cause massive damage to the house beyond the amount you charge for their security deposit. This means you’ll have to get things fixed before letting others move in, further delaying the income you might need from new tenants. Worse yet, say you have tenants who aren’t making their payments on time or in the full amount. Evicting tenants is not as simple as just kicking them out when they don’t pay. This cuts majorly into the overall revenue you receive from your income property. Clearly, there’s a lot to think about when you’re looking to take on a mortgage for a second home. Whatever your concerns or questions might be, our mortgage consultants are here to help. You can call us at (833) 428-0182 or fill out a contact form to learn more or get the process started.